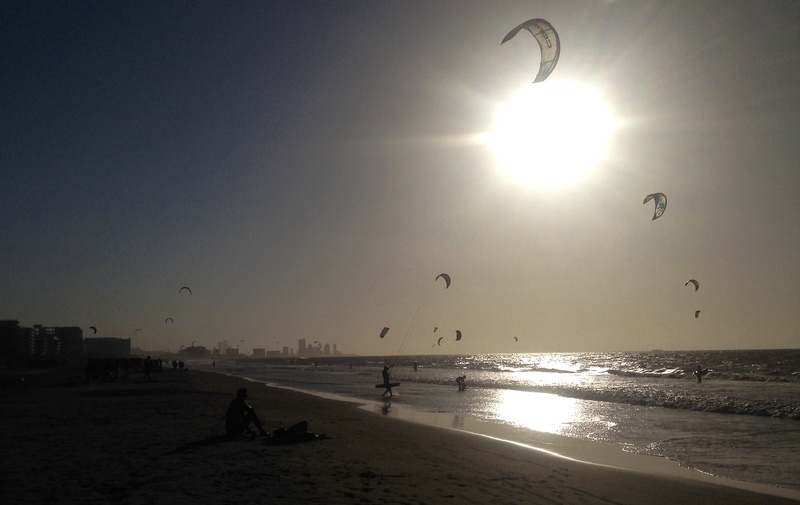 Kitesurfing is pretty popular here at La Boquilla beach. 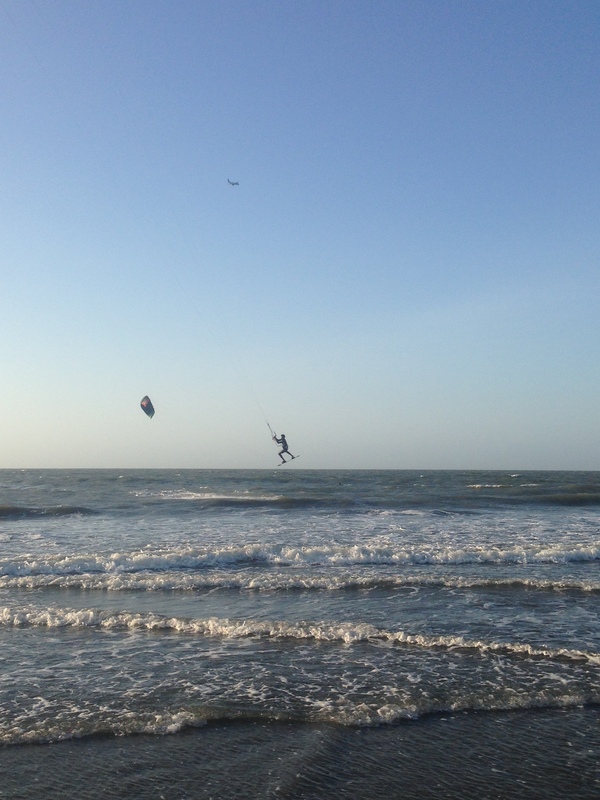 Learning how to kitesurf was possibly the highlight of my year, which was pretty full of excitement this time around. It was at the least an excellent way to celebrate the end of the year, and Cartagena is an amazing place to try it if you go at the right time. While not as consistently windy throughout the year as some places, there is a pretty constant wind for about 3 or 4 months of the year. The beach where we went was perfect, with warm water and soft sand, and getting attacked by a shark didn’t even cross my mind while I was there (it’s usually one of the top 5 reasons why I find it mentally difficult to remain in the ocean whenever I try to go for a swim, along with seaweed, jellyfish, boats, and unexplainable warm or cold spots in the water). Our AirBnB host, Miguel, had his own kitesurfing board hanging from his living room wall. I asked him about it and told him that I’ve been wanting to try it. In the afternoon on Christmas we went to the beach, and Miguel introduced me to his friend, Jesus, who is a professional kitesurfer and instructor. He offered me a discounted rate if I wanted to try it for an hour or two. I didn’t have any money with me, but Jesus trusted that I would give it to Miguel to give to him if I didn’t come back for another lesson. It didn’t take much convincing for me to accept a lesson. Jesus and Miguel show me how to get the kite ready. For the first 20 minutes or so, I felt like I had gotten myself into something that was way over my head (literally). Controlling the kite was astonishingly difficult, and I almost regretted trying, thinking it was not for me. I could see how it could be dangerous to someone who didn’t know what they were doing, as the kite was very strong and almost pulled me away a few times. There was a bit of a communication barrier, since I hadn’t learned much Spanish yet, but Jesus was pretty good at explaining in English. I did have trouble determining whether he was saying “now” or “no”, which could have been a problem when I urgently needed to pull the kite one way or another (“now left or no left?). However, by the end of the lesson, two hours had gone by and the sun was starting to go down. I was having so much fun, and I hadn’t even gone in the water yet! The next day, we didn’t arrive to the beach until after 4:30, so I only got about an hour of lessons before the sun set. This day was spent mostly in the water, but without the board. Jesus had me controlling the kite, while he hung onto my harness and the kite pulled us downwind. I didn’t realize how far we had gone until the long walk back on the beach after the sun had set. Jesus teaches me how to control the kite from the beach. The third day I was determined to get to the beach and get on the board. It was our last day in Cartagena before flying to Medellin. Miguel had to work, so Dallas and I took the bus from his neighborhood to the beach. Four and a half hours later, Jesus had trusted me enough to stand up on my own and kitesurf into the sunset. Changing direction without dropping the kite was still challenging, so I definitely feel like I need to go out again and practice this new sport. Since the previous two days had only been 1-2 hour lessons, I had no intentions of staying for as long as I did on the third day, and I hadn’t brought enough cash with me. The only ATMs were a bit of a drive from the kitesurfing school, so Jesus drove me over to the nearest one on his motorcycle. I tried to take out cash, but it didn’t work! Maybe I missed something…the ATM is in Spanish, so I may have done something wrong. I tried 4 more times and no money, so I told Jesus I needed to try a different ATM. He drove me to a store that had an ATM, and I repeated the process of trying 5 times to take out money unsuccessfully. I explained to Jesus that my card wasn’t working, but it had worked in a different brand of ATM just two days ago. He said he could take me there, but we had to go back to get helmets. 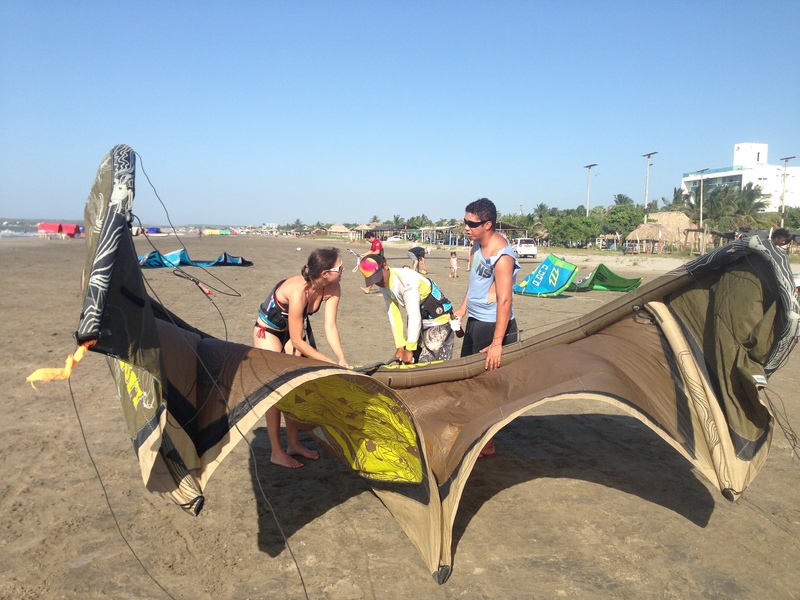 Some of the best professional kitesurfers in Colombia come from here. It was mesmerizing to watch all of them. Dallas was diligently waiting for me at the kitesurfing school, and I felt terrible about making him come to the beach with me in the first place. He hadn’t even brought his ATM card with him, so we weren’t able to try that one to take out money. We decided that Jesus and his friend could take both of us to the ATM that was further in the direction of Miguel’s house, but if it still didn’t work I would just give money to Miguel to pass on to Jesus later that week. Riding on the motos was really fun, but also a bit terrifying. They drive the same way that the cars drive, without a second thought about swerving into the opposite lane to pass traffic, and they’re even more flexible in that they can squeeze into tighter spaces than cars. We stopped at two more ATMs with no success. I felt awful. I gave Jesus what I had with me as a tip, and promised him I would resolve the problem and get money to Miguel when we got home. He was always smiling and very understanding. When I got back to the house and could use a phone, I discovered that my bank had deactivated my card even though I had informed them of my travels. What inconvenient timing! I was able to get my card to work again that night, and I wrapped everything that I owed up with a thank-you note for Miguel to pass on to Jesus. Now I can’t wait to get back on the water and try some more kitesurfing! Posted on 9 January 2016, in Colombia and tagged boquilla, caribbean, cartagena, colombia, kite, kitesurf, kitesurfing, lessons, ocean, sports, surf, surfing. Bookmark the permalink. Leave a comment.